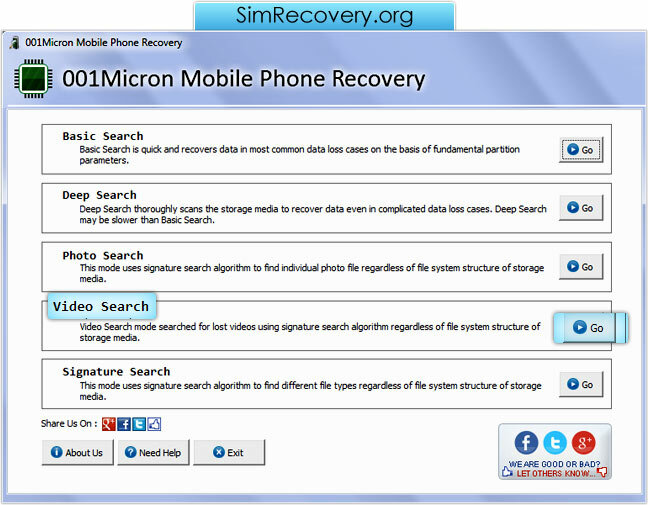 001Micron Mobile Phone Recovery Software allows you to recover lost or missing data including images, pictures, videos, wallpapers, audio songs and other crucial files from mobile phone mass storage devices. Mobile phone recovery program recover lost data due to battery failure, virus infection, accidental deletion and other data loss reasons. Mobile phone data recovery program is developed with inbuilt disk scanning technology to search and retrieve entire deleted or lost data. Mobile Phone data recovery program recovers all lost pictures, songs and other data saved in different formats such as MP3, APE, MTS, AVI, JPEG, PNG and many more. √ Recover all deleted data: Mobile Phone recovery software successfully restores deleted photos, songs, ringtones, wallpapers, documents and other data from different types of mobile phone. √ Provides different search recovery techniques: Mobile phone recovery software provides different searching modes including Photo Search, Video Search, Signature Search, Deep Search, Basic Search to find and recover data. √ Easily saves lost data : Mobile phone data recovery software deeply scans your phone and saves recovered data at user specified safe location on PC. Select the drive and searching criteria. Select the partition from where you want to recover data. After selecting the partition the disk is scanned for the data. Select the files and folders which you want to save. Save your recovered data at specific location.